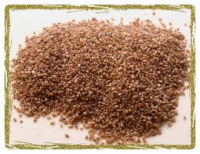 Amaranth is a nutritious grain that was a staple food of the Aztez and Mayans. This protein packed grain has a delicious nutty, earthy flavor and has a high glycemic index. Amaranth is a rich source of protein, fiber, and lysine, which helps the body build muscle and absorb calcium. Amaranth can be eaten as a breakfast cereal, popped, mixed with other grains, and added to soups. Barley is a whole grain with a chewy texture and a nutty flavor. It is commonly found in bread and beverages. Barley has a large amount of dietary fiber, manganese, and niacin. It also has a low glycemic index, which makes it great for diabetics. It is also said to help prevent gallstones. It can be added to soups, stews, and cooked in broth. Buckwheat has a very bitter flavor and roasted buckwheat is said to have a taste similar to dark toasted bread or a very hoppy beer. Buckwheat contains manganese, copper, and magnesium and it is even used to create gluten-free beer. Toasted buckwheat is called "Kasha," and it can be cooked with onions, and pasta for a delicious side dish. Bulgur has a tender chewy texture and a mild nutty flavor with a moderate glycemic index. This grain is low in fat and high in manganese, iron and magnesium. It is a great sourse of plant-based protein and fiber. Make it as a quick side dish mixed with chopped up vegetables, nuts, and whatever else you'd like. Cornmeal is a course flour made from dried corn. It has a gritty texture and a very mild taste. Cornmeal does not contain gluten, so it is a great cooking ingredient for anyone on a gluten-free diet. Cornmeal is a rich source of dietary fiber, iron and phosphorus. It also has a fairly high glycemic index. Use cornmeal as a flour replacement in recipes, in cornbread, or cooked as a side dish. Grits and polenta are made from cornmeal. Einkorn is an ancient wheat and is the purest form of wheat, because it has never been hybridized; meaning it is exactly the same now as it was thousands of years ago. Einkorn is a more nutritious grain that contains higher levels of protein, essential fatty acids, phosphorous, potassium, pyridoxine, and beta-carotene. Its unique composition of gluten makes it easier to digest. Einkorn wheat flour can be used in place of regular flour in recipes. Oh, and it tastes like wheat. Farro is a plant and grain that tastes similar to brown rice. It has a nutty taste with undertones of oats and barley, but it is lighter than other whole-wheat grains. Farro is high in protein, fiber and vitamin B complexes. It is also fairly low on the glycemic index and fairly low in gluten. Farro can be cooked like rice on the stovetop or in the oven. Freekeh is made from roasted and rubbed green durum wheat. It has an earthy, nutty taste and a chewy texture, similar to quinoa. Freekeh is an ancient Arabic grain, and it's name literally mean "to rub" in Arabic. It is a popular grain used in many Eastern Meditteranean dishes. Freekeh is high in protein, dietary fiber, B vitamins, and manganese. Freekeh can be used in many dishes including soups, pilafs, salads, and chilis. Kamut is an ancient wheat that has never hybridized or genetically modified, which means it is exactly the same as it has always been. It has a rich fatty acid profile and is known as "high energy" wheat. It's texture is firm, and it's taste is sweet, nutty, and buttery. 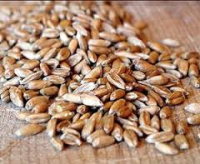 Kamut is easily digested and it contains more protein, amino acids, vitamins and selenium, zinc, and magnesium than most modern wheats. Kamut has a low glycemic index when eaten as a hot breakfast cereal. As cold cereals and puff grains the glycemic index is high. Kaniwa is a quinoa-like superfood that grows in Peru and Bolivia. Unlike quinoa, Kaniwa does not have a bitter outer coating. It has a nutty, slightly sweet flavor and a hearty texture. It is high in protein, amino acids, and iron. Kaniwa is also gluten-free, so it is a great choice for anyone on a gluten-free diet. Kaniwa can be added to pancakes, made into an oatmeal with nuts and fruit, and is a great substitute for rice in many dishes. Millet is a small grain that looks like a bead. It has a very mildy sweet and nutty flavor. It is an ancient grain that is common in the hot climate of Asia and Africa. Millet is very in high B-vitamins, calcium, iron, potassium, zinc, magnesium, and healthy fats. Millet makes a great rice substitute in many dishes and can also be the basis of salads, soups, and hot breakfast cereal. Oats have a very bland nutty taste, but they are a very healthy choice. Oats contain a lot of fiber, which keeps you full longer. Oats also contain a high amount of manganese and molybdenum. They are a great source of phosphorus, copper, biotin, vitamin B1, magnesium, chromium, zinc, and protein. Oats can be enjoyed as a hot breakfast cereal with nuts and fruit, in yogurt, smoothies, and even ground up to make oat flour as a healthy regular flour substitute. When buying oats, look for steel cut oats or old fashioned rolled oats. The quick oats have much of their nutrients stripped away. Quinoa grows from a plant in the goosefoot family. It has a natural coating that gives it a bitter flavor, which should be rinsed off before cooking. Quinoa is a complete protein, which means it contains all 9 of the essentail amino acids, making it one of the most protein rich foods out there. It contains a lot of fiber, as well as lysine, iron, magnesium, manganese, and riboflavin. Quinoa can be used in place of rice in any dish, and makes a great hot breakfast cereal. You can also mix it with cooked vegetables and chicken for a one bowl meal. Regular rice comes in two different colors, Brown and White. Brown is the more nutritional rice, and has has a nuttier taste and a chewier texture than white rice because the bran layer is still on. Brown rice is a great source of manganese, phosphorus, selenium, copper, niacin, and magnesium. Brown rice is high in carbs, and moderately low on the glycemic index. It can be enjoyed as a sdie dish to many different types of cuisines. Rye is a grain has a unique earth "spicy" flavor. It is often associated with a sour or caraway taste because Rye bread is usually made with sourdough. Rye makes you feel full quickly because the fiber it contains binds well with water molecules. Rye contains manganese, dietary fiber, phosphorus, copper, pantothenic acid, and magnesium. Rye can be made into bread, or made as a side dish. Sorghum is sold as a whole grain, a flour, or a syrup. It has a mild, earthy flavor. The syrup is used as a sweetener and sorghum flour is a good gluten free substitute in baking. Sorghum is very high in protein, with 22 grams per cup. It is also a great source of magnesium, copper, calcium, zinc and potassium. Sorghum flour can replace regular flour in any recipe. Spelt is a light grain with a slightly sweet and nutty flavor. Spelt is rich in vitamin B2, manganese, thiamin, copper, magnesium, and niacin, which improves circulation and reduces cholesterol levels. Spelt has a lower glycemic index, which makes spelt bread a great choice for anyone keeping an eye on their blood sugar. Spelt flour is great when used in baking because it is light, and baked goods come out soft and tender. Teff looks like poppy seeds and it has a nutty and grainy taste. Teff is grown in ethiopia and it is most commonly used to make sourdough bread. It is high in iron, and gluten-free. It has a low glycemix index which makes it a great choice for anyone keeping an eye on blood sugar. It is also low in sodium, low in fat, and high in fiber. It can be eated steamed, boiled, or added to many different foods such as pancakes, cereals, and breads. Triticale is a cross between rye and wheat, and tastes a lot like wheat. It contains more protein than both rye and wheat and has less gluten. Triticale is also high in fiber, magnesium, and folate. Triticale can be used the same way as rye or wheat flour is used in recipes, as well as cooked as a breakfast cereal. Wheat is a cereal grain that is cultivated world wide. Wheat contains thiamin, protein, niacin, folate, and vitamin B6, as well as minerals like magnesium, zinc, and manganese. Anyone who has celiac disease, a gluten allergy, or is on a gluten-free diet should not consume products containing wheat. Wheat is used in many, many foods, like as breads, pastas, cereals, and desserts. Almost all processed foods have some sort of wheat component. Wild rice looks like a long-grain rice with a thin brown/black skin with an earthy, nutty flavor. It's texture is chewy because it still has its bran intact. Wild rice is high in fiber and keeps you fuller longer. It is also rich in minerals such as phosphorus, zinc and folate and is a great source of protein and complex carbs. It is a low glycemic grain, which makes it a great healthy choice. It can be added to soups, breads, and used as a replacement for regular rice in any dish. Stay away from processed grains. Processed grains have been milled, which is a process that removes grains of their germ and bran. Unfortunately, this is where the nutrient and fiber rich parts of the grain are. This means that they have very little nutrient value, and they do not fill you up. These food are usually high in gluten, and contain artificial coloring and flavoring, as well as other chemicals. There are many different types of cereals out there. Unfotunately, most of them are not the healthiest breakfast choice. Stay away from any cereal that is high in sugar, such as Froot Loops, Captain Crunch, and Cinnamon Toast Crunch. There are some brands like, Cascadian Farms, Barabara's, Peace Cereal, and Kashi that are healthier breakfast choices; however, remember that cereals are processed foods, which means most of their nutrient value has been stripped away. They are then "fortified" with vitamins and minerals, which means chemically processed nutrients have been re added. Granola is a breakfast cereal that contains some forms of rolled oats, brown sugar or honey, nuts and dried fruits. It can make a great snack, or addition to smoothies, yogurt, or oatmeal. Try to find a granola that is low in sugar, and does not contain too many ingredients. Kind Healthy Grains granola is usually a great choice, as it is not as high in sugar as most other brands. Also consider making your own, which helps you monitor exactly what goes into it.